A few people – friends, friends of friends, complete strangers – have asked me what the best solar system to buy is. “How many solar panels?” or “Should I get a battery?” and “What is that thing growing out of your head?”. Note: that totally isn’t me. Nor am I associated with (c) Snorg. But its funny, so click on it. Everybody’s house is a little different. Everybody’s use case is a bit different. Solar isn’t just a cookie cutter approach; at least, not yet. What I can say is that there are a few steps I’d recommend to anyone thinking about installing solar panels and/or a battery. (Oh wait: I forgot the paragraph wailing about how slack I’ve been on the blog. That was it – well except to say I got a new job in November 2017 working in energy which is pretty rad, but keeps me way busy). People want solar for different reasons, and from my experience of the last two years, it breaks down into a few things. Driving down electricity bills is usually numero uno, and there is nothing wrong with that. 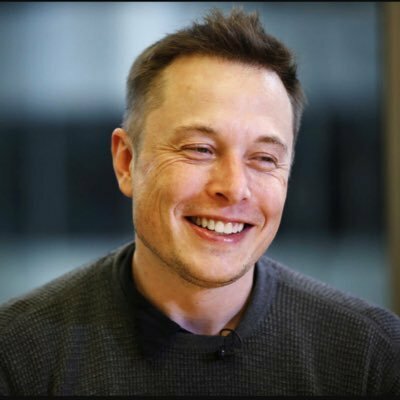 Investing thousands into something functional like a solar PV system, you’d want to see some payback and/or stick it to “The Man” if you’re angry about whatever it is “The Man” has done. Green feelgood is another factor. Reducing your grid needs helps save operating costs on your house, as well as your carbon footprint. You also get to understand your ability to contribute to the energy ecosystem via renewable energy. Curiosity is a relatively new thing, particularly for modern systems with API-driven inverters. Some people (me) like to watch what is happening on their solar system at various intervals, e.g. First place is your electricity bill. Look at the amount you consume on a daily basis across the year. Figure out whether there are major differences between summer, autumn, spring, and winter, and I’ll bet you start to see where the pain points are in terms of running certain devices in summer (AC) or winter (heating). As I’ve said before: most of us get our bill, have a bit of a rage about it, and then pay it and move on. You need to take the time to analyse who you are, and what you use. It will be very helpful. Have you spoken to your electricity provider about getting the best deal? Sometimes we pay too much via “lazy tax” where we can’t be bothered even making a phone call. Have you told your electricity provider that you’re speaking to other electricity providers about the best deal? That can be quite the motivator. Does your electricity provider offer “green” power options? That might elevate your bill slightly, but give you part of that feelgood factor you’re after. Next, I’m going to ask whether you’re doing everything you can to reduce your electricity consumption. Energy Efficiency is a very much overlooked part of housing, particularly in warmer places like Australia. Building standards here aren’t so great compared to other parts of the world, and we compensate using air conditioners. I have to say I’m guilty here of jumping into solar + storage before really checking why my bills were so high. The good news is, I’m addressing these issues now by getting awnings on my west-facing windows as well as installing downlight covers in the ceiling to reduce insulation gaps. Perhaps it is something as simple as setting your thermostat too hot/cold, and trading money for a tiny bit of discomfort. In modern HVAC (Heating, Ventilation, Air Conditioning), each degree you set your AC up or down from 25oC can cost 10% more energy. Not cool. Or hot. Whatever. Check all the gaps around your doors and windows. Deploy window coverings against the sun, or heavy curtains against the cold, wherever possible. Turn off the beer fridge if you’re not really using it. When you replace a device, look at the energy efficiency rating system (it can save you hundreds). The possibilities are not endless, but they’re available, and significant. Alright, so let’s say you’ve covered the energy efficiency thing, and have a fair handle on your bills. That’s half the battle. Let’s talk about solar. CAN YOU HANDLE THE SOLAR? Not every roof can handle a solar PV setup. I’ve lived in a house that could not, due to a lack of appropriate space. Start by looking at your roof space on Google Maps, and see if you have north- or west-facing roof space that might host a decent array of panels, if you’re in in the Southern Hemisphere. For those north of the equator, its south- or west-facing, obviously. In some cases you might even want to have east-facing panels as well, due to your usage patterns. Morning people; they exist. The more complex your roof layout, the more it is likely to cost for installation. Two storey installs can cost more in some cases. Single storey might get tricky if you’ve got multiple roof lines with minimal contiguous area. Roofing material may also determine how difficult the install becomes, as different fixings and sealing methods are required. If in any doubt, talk to a local installer. That’s where Google Reviews and recommendations can come in handy – find the right team and you’ll reap the benefits. The trouble with me recommending anything is that the internet will immediately have an opinion on it. You will read reviews that are negative about perfectly good solar PV equipment, maybe because an individual had a bad experience. There are thousands of combinations of solar panels, inverters, and (if you require it) storage systems from which to choose. You’ve also got different metering options, which can affect how you get billed, and how you might leverage peak/offpeak power rates. “How many panels do I get?” is a pertinent question, and my response is always that panels are cheap, so get as many as you can afford. Remembering that in most new setups, you’re in a “net” situation i.e. the panels feed your house first, then sell any leftover energy back to the grid at a modest rate. Trying to self-consume every last kWh you produce is a waste of time for a grid-connected system, in my opinion. You’ll end up with a smallish system that meets your needs generally, but you’ll miss a lot of the cost offset you get from feed in tariffs, and payback time will be no different, or longer. Panels are cheap. Get as many as you can afford. In Australia, I’d recommend a minimum of 5kW of panels. A system of that type will cost you around $6000-$7000 in Australia (installed). In the USA, Trumplandian authorities will ensure it continues to be about double that. Adding storage can double (or more) the cost of a system pretty quickly. At this point (February 2018) it will extend the payback time accordingly because lithium batteries are still coming out of the early adopter phase. It becomes a question of capital investment versus operating cost. If you get only the solar panels, you can get payback in under 6 years. This makes the assumption that you’re operating the system with a decent amount of thought. Move heavy loads to the middle of the day when the sun is shining and the panels are blazing. Make the most of your feed-in-tariffs, where available. Be aware of your efficiency issues, and address them. If you do all this right, you could get payback down below 5 years, BUT you’ll still be paying an electricity bill, even if its smaller now. Today, the battery option will take your payback up past 6 years again, and maybe as high as 8 depending on the specifics. There is a benefit, though: your operating costs for electricity will be closer to zero than if you have solar alone. Heck, maybe you might even turn a small profit! There are additional benefits to your battery install as well, if you have smart technology like Reposit Power attached to the system. Selling power for $1 / kWh a few times a year might not sound like much, but when your total bill is close to zero, its heading toward profit. It can help you save money on electricity via arbitrage if you have the right metering setup. Reposit maintain a list of good installers to use in Australia, who will ensure you get the best result. But How Much Will I Save??? Well, I can’t really answer that, unequivocally. A lot depends on individual circumstances. I’m saving about $2000 per year over the first two years, having made small changes to how I run my house. I continue to make these changes as I explore ways to reduce my usage. If you’re just going to whack the system in for something cool to look at, but not change any of your habits, expect your savings to match your behaviour. P.S. if you want to move providers, and grab a $35 credit while getting a 12c feed-in-tariff, hit me up on Twitter for my Diamond Energy account number. They’re green, clean, and lean, as well as being partnered with Reposit for Grid Credits. No, not a satisfying fit for your pants! FiT in this context is Feed in Tariff, or what you get paid for exporting the excess electricity generated by your solar panels. If you click on that image, you’ll see sample rates currently provided in Australia. A couple of them might be out of date, for example with Diamond Energy, a company based in Victoria, I now receive 12 cents per kWh. I’m in NSW but that offer is wherever they can service my account. Note that in many cases this is a net tariff i.e. excess solar only, not a gross tariff. You can read about the difference here. There are people still on gross FiT tariffs, getting upwards of 40 cents per kWh. These were incentives for getting the solar industry moving in Australia, and did their job. Some of them were planned out for over a decade, and have given their owners fantastic service. Governments attached rules they thought would be broken easily, like losing the gross FiT if there was a change of owner, or if you altered the system. Consumers got around this by buying the system they could afford and never moving house. As a result, we’ve got a LOT of systems out there under 2kW that need updating to give a net tariff of under 20 cents a fighting chance. A lot of these people are looking at batteries. I suppose, if you’re somewhere like the USA, some of those figures look pretty sweet. Keep in mind that the average import tariff right now in Australia is around 30 cents, after recent price hikes. As a result of this visible mismatch, many people wonder why FiT isn’t much higher. After all, those of us with Solar PV on our roof help lower everybody’s bills! Why do I get paid “only” 12 c / kWh* for my export, when I pay somewhere between 18 cents (off-peak) to 35 cents (peak) for import? * BTW if you like the look of that 12 cents action, get in contact with me via Twitter – if you sign up with Diamond using my details, we both get an account credit. There are several reasons, and for this discussion we’re ONLY talking about the east coast grid (the NEM). That’s where the facts and figures are coming from. First: I don’t work for a big energy company. I get accused of it regularly when I tweet about energy, but I just don’t. I do understand that people need to make money. No business profitability = no jobs = no cashflow for other businesses. That’s simple economics. Of course, maybe companies don’t need to make quite as much money as they do, I suppose. Another truth of our energy market is we have generators and retailers in the delivery chain. This has been the way of things for years, and decouples the generation (industry) from customer service aspect. Speaking for the eastern half of Australia (not Western Australia or the Northern Territory who aren’t on the NEM), this means competition is supposed to happen at two levels: wholesale and retail. The National Electricity Market (NEM) connects the 5 southeastern States of Australia, as well as the Australian Capital Territory. It is the wholesale market. Spot prices are generated to deliver value to generators, so they can pay their staff to manage the backbone of the grid. Additionally, there is the cost of network maintenance as a big line item. There are instances where generators have held back supply until the spot price gets to ridiculous levels. This behaviour is not illegal, but not exactly ethical, and affects pricing. It is being cracked down upon. Retailers operate as clients of this market, and have their own battleground. They need to account for the variation in spot prices in their retail offering, and look at best- and worst-case scenarios. How do they keep the lights on, pay for staff, and ensure they’re getting a slice of the pie? Keep the offering as low as they can manage. This not only means trying to keep prices down to attract customers, but also the FiT paid to those customers with solar. Retailers may have other ways to sell e.g. percentage discount for paying on time. Maybe a few more percent discount for debiting a bank account, which has slightly lower fees than processing a credit card. What do the electricity generators actually make? This is important to understand, if we consider the panels on my rooftop to hold a value similar to the big boys. Check out the second chart here from the knowledgeable @simonahac (and give him a follow because he knows his stuff). The average* of those five dollar values is a tick over $90.00 / MWh. Dividing by 1000 gives us a price of around $0.09 / kWh. If that is what I get paid as a generator, I need to make profit on that, so I need to find the best way to deliver appropriate volume. That is important when we consider the next major leg of the argument. * Yes I’m fully aware that averaging a set of averages is not accurate because of volumes in each primary set. Just go with it. OK, so let’s assume for a second the “power companies” are all money-hungry, price-gouging fat cats swimming through a pool of cash. I group generators and retailers together in that statement, because most people don’t understand the difference. BUT its significant to get your head around the concept, because of the way the NEM operates. Read about that here, without worrying about ancillary services just at this point. In summary: retailers bid for large volumes (MWh) of generator output, which is based on a forecast. In doing so, retailers expose themselves to financial risk. They need to find that sweet spot to on-sell smaller volumes (at a higher rate) to their customers. Market volatility can be huge, and as a retail you’ve got competitors. This is not as simple as selling widgets down the Sunday markets. You can read the details if you like about wholesale pricing in the NEM. As a random dude/dudette with solar panels on my roof, I’m already getting paid a fairly competitive rate compared to wholesale market spot price. If the big boys get around 9 cents, my 12 cents is pretty sweet. There is no way I can enter the market with promised volumes like a big generator. Similarly, I can’t guarantee exactly when I’ll be able to provide my paltry 0-20kWh per day. Is 8 to 12 cents per kWh a fair price, given I don’t meet a lot of the criteria for market supply? I’d say its in the ballpark. I’m around where the wholesale price is, after all. A side point here that the average person doesn’t understand: small consumers pay their electricity rates differently to big consumers. A big consumer will pay what looks like a very small rate – often under 10 cents per kWh. Its a volume discount, effectively. The catch is that the number of kWh they are charged for is based on the peak number of kWh consumed in a half-hour period that month. If a business has one bad day in summer where all the air conditioners and machinery are running, they’ll get stung, and hard. The retailer may only look like making a couple of cents on each kWh, but if they’re charging on the peak consumption, a lot of kWh are empty space. They never arrived. As big consumers become more savvy, and introduce measures to monitor and control those peaks, they can pare back these costs. Retailers might lose margin. Its a game of chess. Let’s say you run a taxi service, and for argument’s sake we’ll call it Wholesale Taxis. Your taxi will run any time of day, turn up on time to bookings, and take the most effective route to the destination. You charge $10 per trip for this service. Let’s say I’ve got a taxi service, and I’ll call it Rooftop Taxis. My taxi only runs during the day – and goes at half pace (or not at all) when its raining. If a cloud comes over, my taxi will slow right down, and you might miss that meeting you booked me for. Would you pay the same $10 for that trip? Not likely. I’d have to cut my rates to reflect what I am likely to deliver. I can still be useful, but I’m not going to get business ahead of Wholesale Taxis, because of the risks my service presents. Before you conservative types go using that analogy as an argument against the reliability of renewables, keep in mind I’m only talking about small scale producers here i.e. rooftop solar PV, or those rare beasts with domestic wind operations. This isn’t a reliability problem; its an issue around intermittent behaviour for the market to manage. And if you want to talk about “baseload”, read this instead, and get back if you gain understanding. I don’t think FiT should increase. I think things are fairly good the way they are, with prices in the ballpark of the wholesale market. I’m of the opinion that FiT in either gross or net guises is probably on the way out. Introducing generation capacity that doesn’t operate through the NEM needs management. That requires a lot of systems to be able to handle abrupt changes in the network. The first point has been done to death. The second point is key. While a few of our politicians would like to pretend its still 1950, the Australian grid has moved on. Coal stations are reaching end of life, or are well past it. Generators are exiting the coal market in Australia, and with good reason. (Also follow Prof Willis – he is another bloke who knows his stuff). At the same time, consumption patterns of users are changing, which render slow-response systems like coal and nuclear of limited value. It takes hours for a coal or nuclear power station to respond to demand changes. Even gas stations take minutes to vary output, and the new grid needs it in seconds. Technology is moving to address this, in order to better integrate renewables and other sources into the wider grid in Australia. Schemes to control demand, including those backed at the highest levels, will assist the grid in coping with peaks. A measure of stability will still be required, though, particularly from multiple, small generators. What is needed is a way to buffer power and hold it back for peaks. Yes, as a Powerwall owner, with Reposit Power GridCredits hooked up, I was always going this way. But it makes a whole lot of sense. As solar and battery prices continue to fall, a new resource is growing in the market: the Virtual Power Plant (VPP). I’ve covered this before, and have not yet seen any convincing argument against it. Besides Reposit Power, companies like GreenSync, PowerLedger, and even inverter manufacturers like SolarEdge are looking at multi-site power trading and optimisation for solar PV and batteries. Would the market continue to purchase intermittent solar PV from small producers, where enough battery storage exists in the NEM? I believe the market players would tend toward the reliability of supply that storage offers. Importantly, batteries can report back how much they’ve got, and how much they can deliver. Consumers would leverage their investment in battery technology, and participate in the market, at better rates than they get now. Perhaps a pure solar FiT would still exist, but not at the levels we have today. It may not be enough, though. That’s where the big boys step in, and start using hydroelectric power as the world’s biggest battery (sorry, Elon). While hydro power is not perfectly green, as some believe, it represents a step forward to a lower-carbon future. In Australia, several people in the know are looking at pumped hydro, which is a form of large-scale storage that doesn’t require a natural river source. Excess solar or wind during the day can be used to pump water uphill. At night, or on demand, the turbines can spin the other way to send electricity out. Even on the driest inhabited continent, there are enough pumped hydro options to help our grid to 100% renewable energy within two decades. 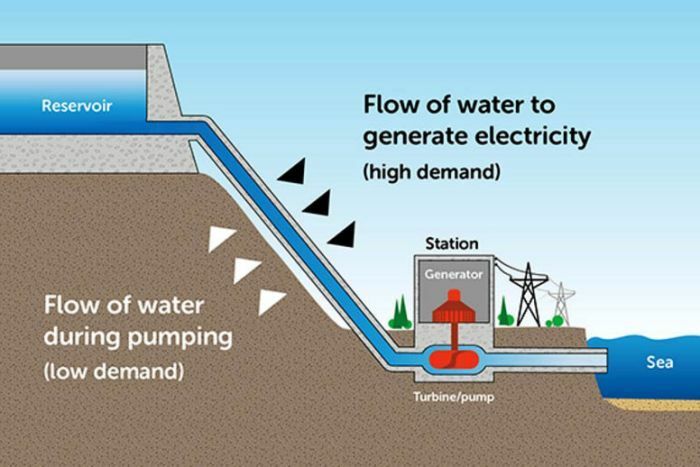 Using wind, solar, and pumped hydro together could be a very feasible answer. Financing them in the face of fossil-fuelled opposition is the road block. Particularly when our federal government cannot formulate energy policy. Storing electricity is going to be critical as the grid evolves. The role of a standard FiT for small energy producers is, in my opinion, up for review. German battery company sonnen has entered the Australian market, with their sonnenFlat product. I would have written about it earlier, but I’ve been suffering a fairly serious flu that is hitting Australia late this winter. On the surface, it looks like a fairly sweet deal. Add a Sonnen battery pack to your existing solar array (or buy that, too), and never pay for electricity consumption again. In return, sonnen get to use the battery storage as they see fit via the concept of Virtual Power Plant (VPP). There are a few conditions of course, as this article from Solar Choice’s James Martin II points out. I’d also urge you to also read the comments section as Solar Choice provides further information via responses. My first impression on seeing the details: this is a mobile phone plan, but for electricity. You pay your $30 a month, use up to the “cap”, and then get charged for excess. So what are the “gotchas”? sonnen will make some money on battery retail, first and foremost. The consumer pays for the upfront cost of the battery system, as well as the ongoing payment. 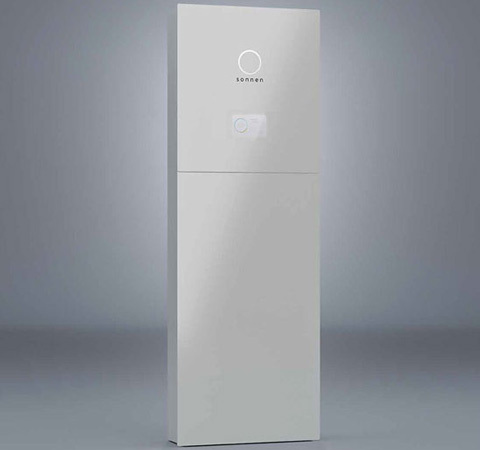 In return, sonnen get a VPP, with which they can play in Australia’s energy market. This may include direct retail of energy, but I don’t see it, despite their promises to “kill” the traditional energy model. When the sun goes down there is no generation available to them as a standalone provider, and the battery users they are supplying “free” power to will take most available demand from storage. Most likely, sonnen will seek a partnership with an existing generator and/or retailer. There is already talk of sonnen investigating agreements with companies like AGL, one of Australia’s largest energy providers. There is a bit of VPP talk going around in Australia at the moment in general. It is one of the ways in which we’re going to address how we manage the grid into the future. It is acknowledged that demand growth for traditional grid generation has tapered off due to a few factors. This includes better energy efficiency, and uptake of renewables behind the meter. Departure of some industries like car manufacturing also contribute. However, the need for smarter demand management is growing, particularly where the consumption profile is changing for consumers and industry. Simply put: we don’t consume energy the way we did in the past. Terms like “baseload” are swiftly becoming meaningless, and I’d urge you to place limited trust in people who say it is a priority! The obvious advantage is cost savings. By investing in a sonnen system, you can fix the running cost of your household for years, literally. Paying $360 per annum for electricity would sound like a fairly sweet deal for most, particularly as some consumers have just seen price hikes of up to 20% in Australia. There is the up front cost that could make the whole conversation moot. Like the arguments around leaving the grid altogether, capital outlay is going to be a deal breaker for a lot of people. In one of the comment replies in the Solar Choice article, they note that the “cap” includes ALL usage in the house i.e. not just imported electricity. This starts at 7500kWh per annum for the $30 plan. For the consumer who can afford the investment, and just want a set-and-forget system, that makes a lot of sense. The consumer doesn’t have to micro-manage the system, and maybe has the option of getting a little bit smarter about their usage to try and fit under a lower cap. One real risk is for those users who sign up thinking its all about “free electricity”. If they don’t look after their consumption, it will start to hit the hip pocket, and quickly lead to consumer regret. And what if your household doesn’t consume 7500kWh per year? As unlikely as that sounds with 20.5kWh to play with. What sort of plan do you go on? It is critical to understand your consumption across the year, before deciding which system or plan to sign up to. Does It Fall (sonnen) Flat? I’m a consumer who bought a battery without a plan like sonnenFlat behind it. I took some actions to maximise that investment, particularly trying to ensure the house runs lean. The statistics I’ve compiled bear this out. My consumption figure of ~16kWh / day via the system APIs is lower than the ~21kWh / day I took from my billing data. The less I consume, the more I can export, which produces direct financial benefit for me. I’d also like to think it lowers my carbon footprint a bit. This is a secondary problem I see with sonnenFlat: you don’t get any benefit from being smarter or better about your energy consumption. Where is the incentive to use less? To me its a similar argument to those people who are on-grid, but try to consume 100% of their solar generation. Sure, that’s great if you’ve got a smaller PV system and need to be really smart about your use. I think the concept of sonnenFlat is moving in the right direction in several key areas. The surety for consumer electricity bills, while not demanding too much of their capacity to understand the system, is great. The addition of more battery capacity in a VPP adds important ancillary services to the grid. This helps the grid evolve and integrate to these new, smarter services. It also shifts the discussion about batteries further into the spotlight for the “Mum n Dad” consumer. While the Tesla Powerwall created a spark, it was priced only for early adopters. Powerwall 2 suddenly put the financials into reach. This type of offering – promoting batteries as a service, not just a device – is an important step for consumer markets. One day, batteries and solar will not be a case of “are you getting one?” but more “which one are you getting?”. The entire retail model is evolving, to the point where you’ll buy your battery and have a plug-n-play installation. Installing solar is slightly more difficult for the average home owner, of course, but it can happen. IKEA are already offering shopfront retail in the UK, and it will only spread as retailers see profit in the full suite of service provision. In the absence of anything resembling progressive Federal government policy, all these elements assist our systems to evolve. More importantly, they help inform our consumers, who are also our electorate. I’ve been a bit busy to monitor my usage regularly, of late. Feeling out of touch, I made a point of checking my solar generation after recent rainy weeks. It seemed a little low. Usually I hit 5kW around the middle of the day, but was peaking out at 4.6kW. I was contacted by someone who lives nearby with a corresponding fall in numbers. The only theory we have to go off is lower angle of the sun. Additionally, because there were two weeks of Autumn where we almost never saw direct sunlight, we didn’t see the slow decline over time. Its like seeing someone’s kids only occasionally – can’t believe how much they’ve grown! Their parents see it every day. Having not checked anything for a while, I headed over to the SolarEdge Monitoring Portal to compare their results to Reposit. Having a second source for comparison is very helpful to sort out any discrepancies. Well, there certainly have been some changes! And all of them look like winners. The first noticeable change was the new Monthly profile for Power and Energy. There was a period where the “self-consumption” figure wasn’t being reported through some conflict with the Reposit interface. That’s back, which is great. Added to this is the “From Battery” stat which is quite cool. It features both in the Consumption summary figure, and the bar graph. This is only recent, so I look forward to that percentage figure “from batteries” smoothing out with a larger data sample. If you mouse-over any of those bar graphs it gives you the details, in kWh, for the days that have been completed. Again – very vool. I also hadn’t given much thought to the year-on-year comparison before I had enough data. Now its very handy to answer questions I and my near-neighbour have about long-term performance. For reference, the figures are in the table below for the three months with suitable data. * As of April 24. What I find really interesting is the March figure; despite having an extra 1.5kW of panels this March compared to 2016, the weather meant I didn’t generate quite as much. Moving forward, I’m sure subsequent years and months will prove to be most interesting. I love me some data! They’ve also updated the Overview panel to have near-real-time feeds of consumption. I did a quick screen cap of this and stuck it on my YouTube Channel. I like. All in all, a great round of SolarEdge Updates as we move toward the cooler months. Realised it has been over a month since my last update. I’ve been kind of busy doing stuff with work, family events, and also putting a Rugby Club through its pre-season setup. Finding time to sit and think has been a bit hard. At the same time, there is so much happening here in Australia with regards to renewable energy, its difficult to keep up! Now, nobody in their right mind should be writing 7.2kw’s as that’s just bad grammar. Second issue is they’re using a lower case “w” to represent “Watt” for both panels and battery, which is wrong in every scientific manner. Third issue is the battery is listed as “kw” instead of “kWh” – always remember that batteries are energy storage. This means they should always be listed with their kWh (kilowatt hour) figure to understand. Beyond all that, the pricing is just cray-cray, and so is the manner of billing. A friend of mine contacted them and they sent him an invoice for the full $12,990. This is weird as most equipment sales would take a deposit (maybe as little as $1000), instead of the full amount to get started. As it is, he cold-called LG Australia directly, who were aware of it, but couldn’t say much for legal reasons. He also dug a little deeper on the website with the original promotion to see what he could turn up. Both leads turned him onto the fact that this wasn’t all that it seemed, so he backed right off. Good move. 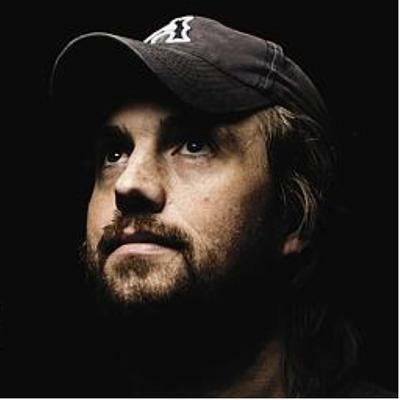 As reported both here in Australia and overseas, some interesting tweet action went down between Atlassian’s Mike Cannon-Brookes and Tesla chief Elon Musk. I don’t need to bore you with the details of the tweets themselves; if you’re here reading my blog, you probably saw it go down. However, if you’re reading this from overseas, what you need to understand is that the talk about batteries is going ballistic here. MCB and Musk really kicked things off for South Australia’s call for grid-scale battery proposals. But the process was also well underway in the state of Victoria, seeking to go large on storage as well. Several people I’ve talked to in Canberra (our nation’s capital) are saying the phone is off the hook from government offices. Suddenly people are realising that a smart, integrated grid is a thing we need. The people in power are starting to come around to the fact that coal is going to collapse, and that idiot behaviour about it needs to stop. 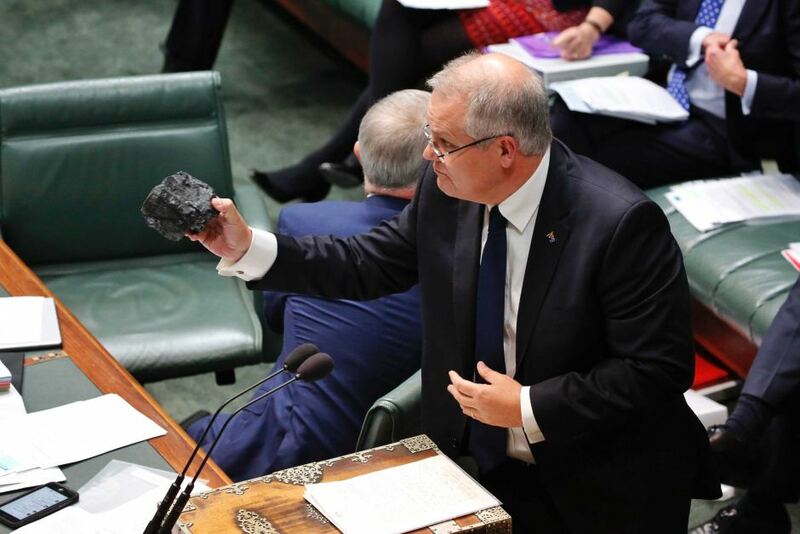 That is the Australian Federal Treasurer, waving a lump of coal around in our House of Representatives. Of course, politicians are populists by nature these days, so it remains to be seen whether talk of batteries survives the Next Big Issue they invent. Lenore Taylor provides a great breakdown in The Guardian on why this is important, in terms of how a leader, thought of as progressive, is still held back by the dinosaurs in his own party. You should read that article. Go ahead – I’ll wait here. My issue with it is in the execution. Expanding the Snowy Mountains Scheme in this way is an increase of 2000MW (2GW), which is not insignificant. It’ll cost AUD$2B which is also a pretty fair price. BUT it will take somewhere between 4-7 years by all estimates. That means it isn’t really going do much more than keep up with demand, if at all. There is also the danger that the goal posts will have moved entirely during that time. As I posited last year in Agile Energy Projects In The Marketplace: big projects can quickly become unwieldy. Projects designed for even 30-year life cycles will find themselves at risk of rejection. It will be simply uneconomical to support such inflexible systems. This is true in a market where things are changing rapidly, and particularly true in Australia, where we are shutting down old infrastructure. The removal of the “baseload” paradigm is going to become more common, and require a smarter, more responsive network to cater for integration of many new technologies. Hydro Power is as subject to this brave new world as much as wind, solar, or other sources. I think we’d be better off kickstarting a solar thermal industry. This month sees the Powerwall v2 landing on our shores. It promises to be interesting times as we move from the early-adopter stage into mum-n-dad market. The housing market is already seeing the potential, with Metricon offering Solar + Storage in home builds in the state of Queensland. Powerwall v2 promises to really shift the landscape, offering twice the capacity of my unit, for roughly the same price. Other manufacturers are going to need to start offering more capacity or other desirable features to keep up. Along with the big battery moves, 2017 looks like its going to be a very interesting year. Most predicted we wouldn’t hit this stage until 2020, but here we are! Many jobs, with new types of infrastructure projects, will be required to make this happen. That means opportunities for people to jump on the train as its leaving the station. Note: I’m always open to proposals in this regard. Here in Sydney it has been rather damp the last month or so. Tropical cyclones off the northeast coast of Australia have caused a lot of damage there. The storm train they pushed south has kept the cloud in play for many days. Looking at my statistics, the last 28 days have seen generation below 21kWh / day, compared to a lifetime average of a little over 23kWh / day. Consumption is also down, which is in part due to tapering off the pool pump now we’re in the cooler months. Import is sitting around the average, though I haven’t needed the grid too much. The occasional Reposit Power off-peak import has bumped this number up a little, but I’m thankful for saving a few dollars. Now that its been a year, with statistics, I’m satisfied that things will just tick along without my intervention. I don’t really have time to watch it 24/7 anyway! I’ve started overriding my obsession with checking the system every 10 minutes. Let’s get straight to it: 50 cents per day. That is what I paid for electricity over the 350 days of billing I have since the Powerwall was installed, and my electricity provider changed over. This is important to note, as the two weeks up to change of provider meant I wasn’t getting any export benefits from my solar panels. Mugged! The saving is over the $2000 mark, but for the sake of round numbers, let’s call it $2000. To put in perspective what money means to my family: our recent road trip, to central and southern NSW, cost almost exactly that. Essentially, I got my little summer break for free. Not quite the 1:3 ratio I was looking for, but that figure is probably no longer simple to calculate, which I’ll explain below. That is kind of the feelgood stuff, despite the Powerwall not necessarily being “green” as people might imagine. As with anything, there is a carbon cost associated with production. The early iterations of any battery product are going to be a little bit on the dirty side. As one example: Lithium ore needs to be shipped from the mine to the refining facility. The refined lithium is then shipped to the cell production facility, which may or may not need shipping to the final place the Powerwall was built. Tesla are addressing this with “vertical integration” of production, particularly for their cars, but also batteries in general. This means more processes can be done at one site, reducing shipping costs (and therefore carbon c0st) of transporting components. Keen observers will remember that in October I got more solar panels. That took my total system size to 6.5kW of panels. I just heard a bunch of critics trumpet “AHA!” but keep in mind, I still only have a 5kW inverter. Therefore the maximum power I can generate is limited to 5kW, though the peak time lasts a bit longer on a sunny day. It is hard to quantify what effect this has on the system, beyond saying “there is more solar capacity”. As the new panels are oriented WSW they’re not always going to be ruling the roost in terms of efficiency. Its also a smaller factor than it otherwise would be, having been installed four months out of the year. Granted, they were the sunnier months. Another consideration is my move to Time Of Use tariffs in the first week of August. This has an effect on two areas of my billing. If I’m smart enough to “game” the tariffs, and avoid doing anything during peak time, I can save a lot. Unfortunately peak time coincides with oven and air conditioner use, so that’s not always possible. The billing and the import numbers above will be affected by Reposit Power managing tariff arbitrage. When I import power now, it might be a result of my needs being bigger than the system output, the battery being empty, or because Reposit sees a cloudy day and wants to import some at a cheaper rate. Putting together the new panels and move to TOU, a better time to revisit this might be October this year. That way, I’d have a true idea of what I can really save with all components working together. Those out for a bargain will know to shop around with their electricity companies, and see how best to maximise their savings. Whether that is through generous sign-up rebates, or big discounts for paying on time or via direct debit. It all adds up, and people without solar or batteries can benefit if they do their research. As I pay such low amounts anyway, discounts don’t add up to much. Pay-on-time discount across the year was $20, and paying by Direct Debit discount was $17.62. The bigger benefit was referring people on to Diamond Energy, which netted me $105 across the year. Against that, I paid $22 (inc GST) application fee with Diamond, so the benefit was more like $83. If we add that $83 back onto the billing, it goes from 50 cents per day to 75 cents per day. I pay about $1 a day to connect to the electricity network, so its still good. There are even a few dollars in GridCredits unaccounted for at this point. When I say “Year Of The Powerwall” I’m not speaking only to the year I’ve had. This year, 2017, marks the landing of Powerwall version 2 in Australia, and overseas. I’ll level with you: I haven’t really spoken much about PW2 since the launch, because I’m still experiencing some angst. I thought I’d done OK with my battery, then in the same year, Tesla brings out one TWICE as good. C’mon Elon… I thought we were mates! Overall though, this is a good thing. I think we’re about to see the domestic battery market kick off in 2017, with Tesla in front. That is quite amazing, given the prediction was market maturation in 2020. We’re three years ahead! Talking to a few people getting quotes and installing them, right now there are very few people price-competitive per kWh. As the manufacturers in Korea and China start their own uplift via vertical integration, prices are going to keep sliding, and competition increase. This can only be a good thing for the consumer, for the grid, and for energy security and stability moving forward. And any consumer who is getting a Powerwall 2: I think a zero electricity bill is well within reach. If you factored in selling power back to the Grid out of the battery, which I think will replace solar feed-in tariffs eventually, you could even turn a small profit. As always, user experience may vary. Its up to you to make the most out of your investment. As I wrote earlier in the month, we have had some heat wave conditions here in Sydney, with outside temperatures getting into the high 40s (120oF). That was kind of insane, but it kicked off some GridCredits for me, which is also a good thing. As we’re moving toward more extreme weather events, having a flexible and robust grid, with user storage available for emergencies, will be important. This week I’ll be celebrating the First Anniversary of the Powerwall’s installation at my house. How time flies! I’ve been on holiday for a few weeks over summer, and what a summer it has been. In two words: bloody hot. Sydney has been experiencing some of its warmest weather on record, with temperatures hitting up to 45oC (113oF) and not cooling down below 30oC over night. Distinctly uncomfortable. So you end up with successions of hot days, but worse: hot nights. At least it wasn’t peak pricing that day, being a weekend… Small mercies. In addition to the anniversary, I’m also due to receive a bill from Diamond Energy, which will cover November through to January. Putting in a guess right now: I’m going to say about $1.20 a day, excluding referrals. Similar to Winter, but with a bit of a discount for better export. That would be a bill of around $110 for the 92 day period. Summer has definitely had an affect on the system, in terms of import requirements. As I mused back in December, summer would require more import, despite having more sunshine to work with. Part of the reason is electricity consumption; on the whole, I am using more energy due to cooling and things like the pool pump. The air conditioner is variable, depending on ambient temperature, and required comfort level. Short of replacing the thing, I’m stuck with needing the grid during summer. How you handle your pool pump usage is up to individual circumstance. My pump has a flow rating of approximately 19,000 Litres per hour, and a pool of 31,000L capacity. I have a cover on it all winter, except for monthly maintenance, and no trees or other debris issues around the pool itself. Therefore, in winter I’ll run it for around 90 minutes per day which should turn the capacity over about once. With appropriate chemical balancing, that keeps it clean. In summer, I’ll vary it a little. During summer peak – where we use it a lot – the run will be 6 hours, timed for peak sun. At shoulder times I’ll start to move toward 4 hours, as we’re not using it as much. The idea is to let the filter work as hard as it needs to, while retaining good chemistry and clarity in the pool. Happy to report that the Powerwall is still reporting its full 6.4kWh capacity, same as Day 1 of the system. The extreme heat over summer also didn’t trouble the liquid-cooled unit. The Powerwall is rated to 50oC, unlike many of its competitors, so even an Australian summer can’t dent it. Unless you’re crazy enough to put the thing outside. In the sun. What I did notice was the rest of the system struggling to get to full capacity. With a total of 6.5kW of panels on the house, I didn’t always reach the 5kW capacity of the inverter. Part of that is the panels getting hotter than their efficiency peak of 250C, and part of it is the inverter starting to feel a bit of heat stroke. Even in the shade, on the south side of my house, it gets bleeping warm. Back in October I was hitting some sweet numbers, but the ambient temperatures were down in that 25 degree range. Everything performs better when its cool. As the year has worn on, I’ve slowly weaned myself off frantic chart analysis. Its a bit of a pragmatic move, as constantly worrying about my ROI was a bit stressful. While it was important to keep an eye on the system, I’m moving into a stage where I need to look at the future path, not just the past performance. That means I’ll be presenting more ideas-based blog here, and there is plenty to write about. Tesla Energy released the Powerwall 2, which I’ve avoided talking about due to extreme jealousy and consumer cognitive dissonance. Accompanying that is solar rooftop, which I’ll talk about in a future post. World-shaping events like Brexit and the election of Donald Trump are key political events. They have the potential to shape energy policy for years to come. There are also ideas I’d like to explore in terms of other energy sources. That will lead into producing educational content that I can distribute, through various media. I’m also aiming to put up more on my YouTube channel, for which I’d appreciate a “Subscribe” if you’re so inclined. 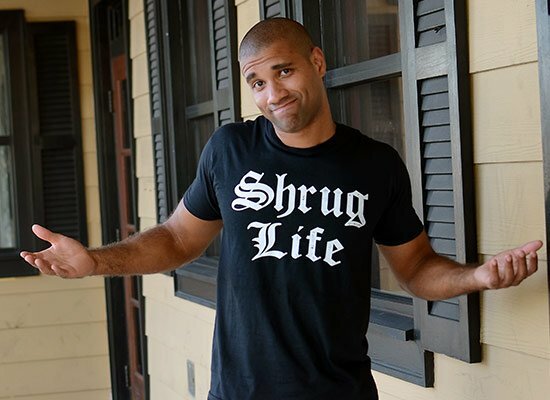 Which I’ll try to fit in around the blog itself, work, family, and running a Rugby Club! This is my entry to the Masdar 2017 Engage Global Social Media Competition. The aim is to describe which technology will help reduce climate change, and why. As scientific bodies continue to explore and model the effects of climate change, the technologists, disruptors, and entrepreneurs are seeking ways to combat it. The use of renewable power in the form of wind and solar is one of the key areas. However, a valid criticism of renewable energy is stability: if the sun doesn’t shine, and the wind doesn’t blow, solar and wind are in under-supply. If the sun DOES shine brightly and the wind picks up, the renewable energy grid produces oversupply. This situation is prominent in the California “Duck Curve”. The belly of the duck is over-generation from solar, while the head of the duck is the consumption ramp for night-time domestic use. As domestic and commercial solar uptake increases across the world, there is a genuine risk to existing grids. Trying to address this issue alongside a mix of traditional power generation is difficult. Large, traditional generators cannot uplift generation, or halt it, at short notice. I believe the natural solution is widespread adoption of storage technology. Domestic storage will mature rapidly over the next 5 years, as household battery options become cheaper, due to vertical integration of the production process. This will be particularly true in established Western housing markets, particularly those dwellings with rooftop solar options. It also enables the concept of virtual power plants for retailers to access power stored in domestic appliances. In the future, consumers will engage in peer-to-peer trading via blockchain and other smart technologies. The net result is to lower the need for a traditional “grid” and the associated maintenance for poles and wires. Industrial storage will see positive disruption to hi-tech engineering solutions, using renewable generation. Efficiency has a large role to play here, as innovation across multiple sectors leads to better production engineering. The volatility of frequency required for running many heavy industries can be offset with larger scale storage. These battery systems act like a buffer, or regulator, in order to provide assurance of stability. Large storage can also be deployed by energy networks in order to back up local power infrastructure. Transport storage is a key area for addressing carbon emissions. While cars are the major playground for this technology right now, the move to heavy transport, agriculture, and public transport offers a range of other benefits. I call it “Transport storage” because it offers more than just a way to move people or goods from one place to another. There is the opportunity to place domestic, industrial, and transport storage in synch, to produce a more efficient outcome for renewable energy. 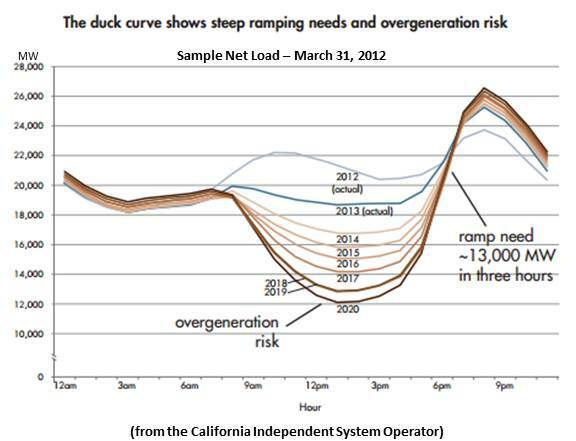 Consider the California Duck Curve I mentioned before. This is the result of “too much of a good thing” when we have an over-abundance of solar PV! What if there was a way to mitigate this? The average shopping mall in most countries has a roof space in the hundreds of square metres. They also contain hundreds, if not thousands, of car spaces. If we add solar panels on that roof space, and storage in the basement, we can effectively create a curve smoothing apparatus by plugging in a suitable number of EVs during daylight hours. A similar system could be used by places of work for the benefit of employees. Such a system would draw not only from the local (mall rooftop) power, but also spill excess renewable energy into recharging the transport network in other places. This might take the form of powering connected public transport – like electric buses or trains – on site, or via the grid. All the while, this large-scale storage and renewable generation helps flatten the belly of the duck during the day. When people return to their homes at night, they can cut the head off the duck using their domestic storage. Storage, along with the associated smart management technologies, provides the cornerstone for a renewable energy future. The combination of increased efficiency, and reduction of fossil fuel burning, is undeniable. If you’ve ever looked at my System Specs page, you’ll see that I’ve got a fair bit of west-facing roof I don’t use. I decided to get an upgrade. First port of call was Natural Solar, of course. They looked at the system, and advised placing an extra six panels on the western roof. The same Phono Solar 250W panels would be used, each with a SolarEdge P300 power optimiser. The two existing arrays tie back to the inverter with one string each. The new array would be joined onto the array to the left of picture (western). This made for the simplest install as it didn’t require new wiring to the inverter. It also provided the benefit of generating from the sun in the afternoon. This is useful in the warmer months where I am more likely to use air conditioning. Additionally, for those days that have overcast mornings, but sunny afternoons, I’d see the most benefit. Particularly true given the house has a rising ridge line to the east, so doesn’t see much sun early in the day. With the detail sorted out, we agreed on a date for Splice Electrical to perform the upgrade. James and Nick turned up, and with their usual friendly professionalism, got to it. A few hours later I was the proud owner of another 1.5kW of panels! Naturally, with an upgrade of this sort, you’re going to expect some improved results. The system has had a size increase of 30% (1.5 / 5.0 = 0.3). Would I get similar generation increases? The main factor in all this is still the inverter. The SE5000 in my system is limited to 5kW in any direction. Therefore, expected generation, even with 6.5kW of panels, is limited to 5kW maximum. I was quietly confident I’d hit this high mark regularly, given I generated 4.9kW or more at points during February and March, and even in May! However, the panels aren’t in the same orientation as the rest of the system, so what is the effect? According to one source, a solar PV system in Sydney should produce 3.9kWh per kW of installed panels per day. That is under lab conditions. I hasten to point out that the data is a little murky. The SolarEdge API consolidates “generation” from PV and battery, because of the way it monitors flow. Therefore, that figure only works if we’re assuming the battery is filled and drained every day. This certainly isn’t the case 100% of the time, but its enough to show we’re in the ballpark. Another part of this is loss due to inefficiency. The Powerwall is about 92% efficient, meaning I have to spend around 1.5kWh of the 19.5kWh figure on the power going into and out of the battery. The other factor is the timeline; we’re looking at a period from mid-February to early October. This includes the shorter daylight hours. With all these factors considered, I’d say this is actually looking like a decent marker, even with the accepted error margin (+/- 10%) in the SolarEdge API. An extra 1.5kW of panels should result in a generation figure of 25.35kWh per day, on average, for Sydney. The first caveat for this figure: it has been spankingly good weather in Sydney for the last week. The new panels are also a different orientation to the others, which may affect the figure. It is also a very small sample in terms of days. In the interests of science, I’ll leave this chart here to update daily. You can check in on it any time you like. A rolling 7- and 28-day chart is also on the Statistics page. Average just shy of 33kWh at time of print. Pretty good weather! A better analysis might be to look at the curves being produced by the different panel setups. The figures aren’t as important as the shape of the curve. That was from May, without daylight savings. The curve peaks around midday and is generally uniform. Pretty much what you’d expect. Decent result, too. Now we throw another 1.5kW of panels on the western side, and add daylight saving to shift the curve to the right by an hour. A small point: that is my record day so far. And its only October. Tee hee! More importantly, we see the extension of the curve from the new peak around 1PM (daylight savings, remember), through until the late afternoon. We get a lot closer to sunset for generation as well. The peak 5kW on this particular day hit at 1128 hours, and it stayed there until 1514 hours. The 5kW system infrequently reached 4.9kW, and then only for short stretches. With the extra panels, not only is the generation figure much higher, but the long afternoon sun really kicks in. As we move further into the warmer months, I expect the 5kW peak to be longer. Most likely, this will result in much more export until the point the ducted air conditioner is required on a regular basis. I need to develop a strategy to mitigate that. Perhaps running the air conditioner in “continuous” mode on sunny days will help. This aims to keep the house cool, and the thermostat will lower the overall energy requirement. I’m still finalising the change in payback time on the new array. Due to the move to TOU pricing, it is getting hard to keep all the facts and figures in order. For the most part, I’m going to keep rolling calculations based on the single-rate plan offered by Diamond Energy. The rest of it makes my head hurt. I’ve had the Powerwall six months now, or in fact a little longer. It would be more accurate to say I’ve had a functioning solar PV with battery system for seven months. That dates back to when my meter was changed over to a basic bi-directional unit. Importantly, it is the date that billing with Diamond Energy started, with full and accurate detail of import and export. I have had a total of three bills, the most recent of which covers 52 days from mid-June to early August. It stops there because I’ve moved from single-rate to TOU tariffs, so Diamond decided to make things easier for calculation purposes. The other two were covered by my blog post back in July. The full quarterly bill naturally received more attention than the one I hinted at in that post. With 174 days of billing data now in the bank, its time to look at a longer period. This post will put up the basically points of interest from the three bills and their relevant statistics. The first bill covered the period of 17th February through to 23rd March. With a connection fee of just over $0.82 / day, and an export tariff of 8 cents/kWh, I was almost covering the connection. Of course, import was going to hit a bit harder in summer time. The last week of February was a record-setter in Sydney. The temperature was minimum 26oC / 79oF for nearly the whole week. Frequently the temperature was over 35oC (95oF) in the late afternoon, hitting those big, west-facing windows. I can only sweat so much! That kind of heat requires air conditioning, which you can see in the red spikes below. It probably wasn’t even the amount I imported, more a case of when it was imported. This is a small precursor to what you can expect from an Australian summer in this part of Sydney region. No ocean breezes this far inland. During this period I clocked some fairly hefty production figures, topping out at around 34kWh, with several days in excess of 30. The heat of a Sydney summer makes me a little cautious in regard to power usage. In addition to the extended hours for the pool, the heat will require air conditioning. That means import. January tends to be the wettest month in Sydney, and storm season. Luckily, for those cloudy days and weeks I’ve got Reposit Power to do the thinking for me. The start date was 24th March, running through until 17th of June, 2016. This was the big quarterly bill which grabbed the media attention here in Australia, with a few overseas articles published as well. As you can see, the daily figures show slight decreases across the board. At my import tariff, this equates to 13.2 cents / day decrease in costs as I’m importing less. The export is 4.8 cents / day cost increase as I’m exporting less. This comes out to 8.4 cents per day. The actual decrease of 9 cents per day is due in part to rounding. Additionally, Diamond single-rate tariffs step up by a small amount once you use more than a certain number of kWh per month. The weather during this period was pretty good. We had long weeks of sunshine, with few rainy days. The temperatures were very mild, meaning we didn’t need air conditioning or heating. The latest bill runs from 18th June through to 9th August, or a total of 52 days over winter. In terms of “winter”, I should mention it never snows here. The closest snow I think fell about an hour’s drive away, in the Blue Mountains. It isn’t frosbite territory, and with the climate warming, isn’t ever likely to be. Short of another ice age, I guess. We do get frosts, sometimes on consecutive days, and the lack of double-glazing, with basic wall and ceiling insulation batts, does mean the house gets cold. We also have a lot of tiled floor. This bill gives a valuable insight into the changes that occur, in a period with less sun and more heating. A little over double for daily cost, and the reasons why are fairly obvious. Import rose by 91%, and export fell by nearly 27%. So it cost me an extra 50 cents per day for import and I missed out on around 18 cents for export. In the ballpark at 68 cents. There were only a couple of days where we ran the heating longer than an hour or so. With the big motor on this ducted system, that was more than enough to start hitting the import hard. Next winter, with TOU now in place, we’ll be a bit smarter. I’m talking to Reposit about the best ways to utilise off-peak power, and how their software handles it. Note: the reason behind the short interval for this bill is replacement of my meter. The GridCredits scheme is reliant on a sophisticated unit, which I’ll put up video of when I get the time. Putting all the information into a table gives a nice summary of the solar with Powerwall six months down the track. Not bad, though of course I have yet to experience a full summer with this system. Summer will mean more power imports as we use the air conditioning. It also means longer daylight hours. Greater export will offset higher import, to a degree. Compared to winter, where heating and shorter daylight hours have clearly had an effect, summer should be slightly better. I’m still at the mercy of those 40oC+ days, but at least I can pay them back a bit. Of course, as panel temperatures rise above 25oC, efficiency will drop. More light = more heat in summer, so I might not see many days above 35kWh with the existing system. Autumn and Spring are looking like the “Kill Bill” (*snigger*) periods for the year. The milder weather and lower heating/cooling requirements are really where its at. Winter is going to be an issue ongoing, with lower daylight hours, and heating requirements. Summer will still need a lot of electricity imported, but can be offset with big exports. The real challenge, moving forward, is to maximise self-consumption, and minimise waste. As always. If I can keep the costs below $1 / day for my electricity, even with recent increases in tariffs, then I’m well on track to save $1900 in the first year. Maybe more after that!